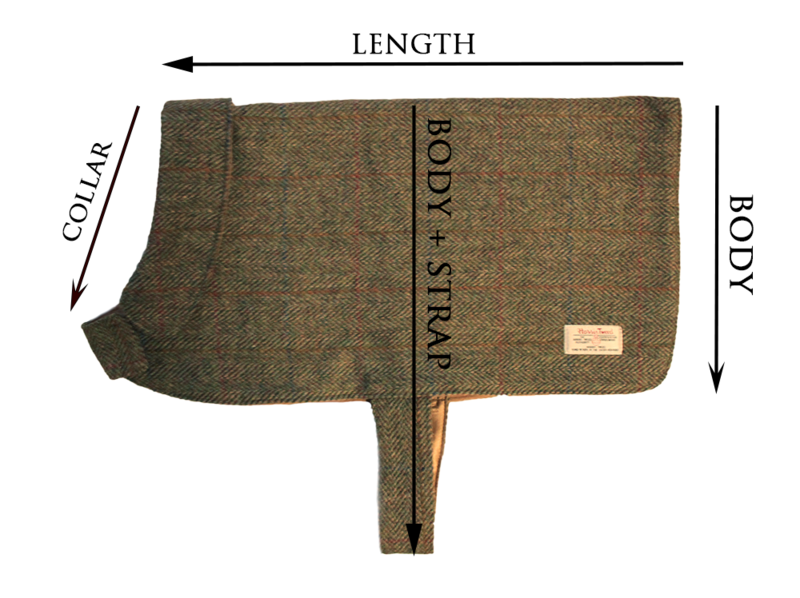 Genuine Harris Tweed dog coat/jacket. Be the envy of every dog and dog walker in the park with one of these excellent doggy coats in a range of genuine Harris Tweed colours. Each coat fastens snuggly and securely with velcro ends. Made with genuine Harris Tweed and displaying the official Harris Tweed stitched logo these jackets will be certain to keep your dogs dry and warm in the winter months yet the lightweight nature of these jackets will help keep your dog cool in the warmer months. A range of sizes are available from size 0, suitable for small breeds and puppies up to size 4 suitable for medium sized dogs. Measurements are available via our measuring guide, found below. Jacket fastens under the neck and under the belly, for a secure fit. XS 8.5 " 5.5 " 5 " 6"
0 10.5 " 6 " 6 " 8 "
1 11.5 " 6.5 " 7 " 9.5 "
2 14 " 7 " 8 " 11.5 "
3 15.5 " 8 " 9 " 14 "
4 17.5 " 8.5 " 10 " 15.5 "